Comfort food | Thinking is the enemy. Baked ziti, food of the gods. I recently had a family medical emergency that kept me at the hospital 12 hours a day, and sometimes more, for two weeks. Things turned out well, but nonetheless it was a grueling experience from which I’m still recovering. Sleep deprivation is an insidious beast. At first you don’t notice it too much: You’re hyped up on adrenaline and caffeine and sugar, whatever it takes to keep going. But bit by bit, your brain loses functionality. Time blurs. You can’t remember what time it is, then even what day it is. The smallest decisions seem impossible. You fall silent while you search for a word. And if you’re like me, you try and buy coffee at the hospital Starbucks with your driver’s license. Many kind folks offered to bring us food (or just brought it without asking). Is this practice unique to the South? I’m not sure, but I grew up seeing these sorts of food deliveries and even making them myself. They could range from obligatory baked goods at Christmas to entire meals for families of the sick or recently deceased. My mother and I made an annual pilgrimage to deliver Christmas cookies to an estranged relative who hid in the back of his house until we had left. So I’m no stranger to the tradition of comforting the distressed with food. But I had never really been on the receiving end before, and I found myself uncomfortable with it. It seemed like such an effort, sometimes at great cost of time and money. We could always buy our own food, after all. But what could I say when someone asked if we needed food? The answer, I finally realized, was “yes” and “thank you.” It just took me awhile to figure that out. It took running out of all our frozen leftovers and standing there, looking at the empty freezer, trying to remember how to get to the grocery store. It took the kind of emotional and physical exhaustion that results in everything feeling too hard to do, no matter how small the task. Providing food seems like such a small thing, but it’s really not. Our culture just tends to devalue it, as with most unpaid work traditionally done by women. Just like our culture promotes self-reliance, doing it yourself, and going it alone. But sometimes we just need a hand, you know? And sometimes we need to lend one. 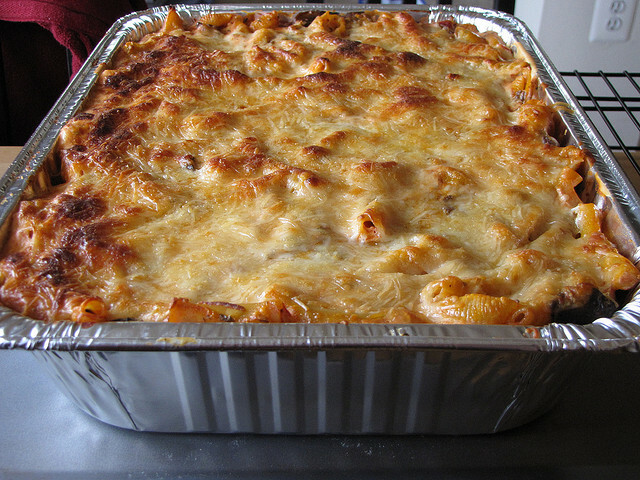 Photo credit: Baked Ziti by Meaghan O’Malley under CC BY 2.0. This entry was posted in Miscellaneous and tagged comfort food, food, food deliveries, hospital, kindness, sleep deprivation. Bookmark the permalink.